Cup of Coffee 6/25: The Gulf Coast League Red Sox opened their season with a loss, while Lowell extended its winning streak. 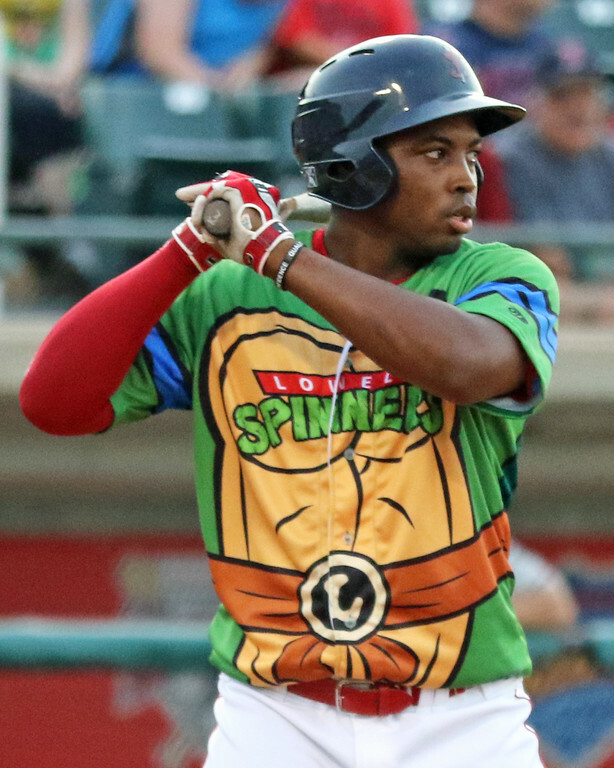 Kyri Washington (pictured) blasted a pair of home runs to carry Greenville, and Yoan Moncada ripped his first round-tripper since his promotion to Double-A. Brock Holt and Ryan Hanigan made rehab starts with Pawtucket, and the DSL Red Sox split behind strong pitching. Three solo home runs in the top of the 10th doomed Pawtucket on Friday after a PawSox comeback sent it to extras. The story of Roenis Elias’ start was his trouble with RailRiders first baseman Tyler Austin, who hit three home runs off Elias and drove in all five runs. After Elias’ 5 1/3 innings, Chandler Shepherd tossed 2 2/3 hitless innings, giving the PawSox time to rally to tie the game at five in the seventh. Robby Scott surrendered three consecutive homers in the 10th. Rehabbers Brock Holt and Ryan Hanigan hit at the top of the Pawtucket lineup, with Holt finishing the day 0 for 4 and Hanigan going 1 for 2. Henry Ramos, Mike Miller, and Jose Vinicio each picked up two hits to lead the offense, and Rusney Castillo doubled and drove in three runs on the day. The 11-3 final score hides a strong night at the plate for much of the Portland lineup, which outhit Reading 15-14 but stranded eight runners in scoring position. Yoan Moncada’s 2-for-5 night included his first Double-A home run, an opposite-field shot in the fourth. Behind him, Andrew Benintendi and Jake Romanski each contributed three hits, a double and a run scored. Nate Freiman, Tzu-Wei Lin, and Tim Roberson all contributed multi-hit efforts as well. Unfortunately for Portland, the offense was wasted by an ugly start from Mitch Atkins, who allowed seven runs in 3 2/3 innings. Reliever Taylor Grover did not fare much better, coughing up three runs in the 2 2/3 innings. Thunderstorms in Salem caused Thursday's game to be suspended for a second consecutive night. The game will resume in the bottom of the fifth on Saturday with Frederick leading 4-0. Kyri Washington stole the show in Greenville Friday. The outfielder launched his 10th home run of the season in the third inning to tie the game at three. Then, with the game tied at five in the seventh, Washington blasted his 11th homer, a solo shot that proved to be the game-winner. Luis Alexander Basabe chipped in a two-run shot of his own, as five of the six Drive runs were scored via the long ball. Jose Almonte allowed five runs in five innings on the hill, but the bullpen slammed the door. Jake Cosart and Adam Lau combined for four innings of scoreless ball, with Cosart picking up the win and Lau nailing down the save. After eight games, the perfect season is still in play for Lowell. The Spinners improved to 8-0 behind a two-run fourth inning Friday. After Nick Lovullo walked, an Andy Perez RBI double and Tyler Hill RBI single vaulted the Spinners ahead for good. Those two runs were all of the support the pitching needed on a night that Hudson Valley mustered just three hits. Enmanuel De Jesus tossed his second dominant start to open the season with seven innings of two-hit, one-run ball. Major League veteran reliever Casey Janssen threw a scoreless inning in his first outing since signing with the Red Sox last week. Gerson Bautista’s 1-2-3 ninth secured him his third save of the year. The Red Sox mustered just four hits in an Opening Night loss on the Gulf Coast. The rehabbing Brennan Boesch went 1 for 3 with a run scored in his season debut. Third baseman Stanley Espinal led the offense with two hits and an RBI. Jhonathan Diaz got the nod for the Opening Night start but took the loss after three runs in four innings. Hildemaro Requena pitched the next four innings, allowing just one run. Marcos Lantigua allowed a run in his one inning of work. The Red Sox were quiet for seven innings but broke out with two runs in each of the final two frames to steal a win from the Dodgers. Eddy Reynoso entered the game as a pinch-hitter in the eighth and made his mark with a game-tying RBI double. He came around to score the go-ahead run on a single from Eduardo Torrealba. Elwin Tejeda was the only Red Sox to notch multiple hits, going 2 for 3. Rayniel Adames turned in a strong start of five shutout innings, but Cesar Gonzalez picked up the win with 2 1/3 innings of one-hit ball to close out the game. A couple of late runs narrowed the deficit, but the Red Sox could not quite finish the comeback. Three Red Sox accounted for much of the offense. Yeison Coca went 2 for 4 with an RBI out of the leadoff spot. Pedro Castellanos ripped a pair of doubles and scored a run, and Kleiber Rodriguez reached base four times, going 3 for 3 with a walk and RBI. Starter Jose Zacarias was the tough-luck loser, throwing six innings of two-run ball. Warlyn Guzman and Roberto Medina combined to three the final three innings without allowing an earned run. Player of the Night: Two home runs — including the game-winning tally — made Kyri Washington the obvious choice for Player of the Night. Lakewood was not the first team to witness Washington’s power, which has him leading all South Atlantic League batters with a .561 slugging percentage. Washington showed raw power before his selection in the 2015 draft, but it did not translate to the game until this season with 11 home runs, four triples, and 11 doubles.